Do you drink a cold drink, a bit of immunityweakens and streptococcal infection begins to host you in the throat. What to do, if we were ill with angina, our site will try to tell and from below in a prepared special materials. Summer heat, so I want something cold ... ice cream, ice-cold beer or carbonated drinks - All rescues from thirst and deliverspleasure, and the pleasure you have to pay for their own health. It's simple. Do you drink a cold drink, a little weakened immunity and streptococcal infection begins to host you in the throat. It often begins and angina. Of course, angina more common in childrenBut adults should take good care of their health. What to do, if we were ill with angina, our site will try to tell and from below in a prepared special materials. First of all, we should remember about the symptoms of angina. 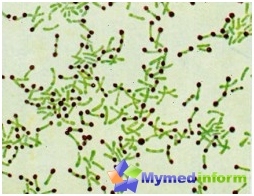 Between the time when the streptococcus starts to develop rapidly and the start diseaseIt passes 1-2 days. Then, at one point, not the person feels weakness, fever appears, headache and pain in the throat when swallowing. Fever does not last long, about half an hour, then the body temperature rises to 38-39S. If you look at the patient's throat, tonsils will "burn" - bright red, inflamed, sometimes with white bloom or small pustules. 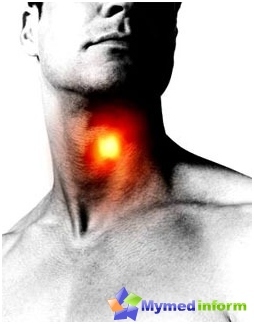 Lymph nodes under the jaw may increase palpation they seem tight and painful. Angina - is not cold, It in no case can not be transferred "on foot". If not recovered angina may develop dangerous complications such as the otitis, Rheumatism, myocarditis, and others. Therefore, one of the most important components of a successful treatment of angina is strict bed rest. Primarily for the treatment of angina at homeconditions it is important to consider features of the disease. First, the heat causes enhanced evaporation of moisture from the skin. Therefore, angina ill person needs a lot of liquid. The liquid will not only prevent dehydration but also help to remove toxicity and reduce the temperature. 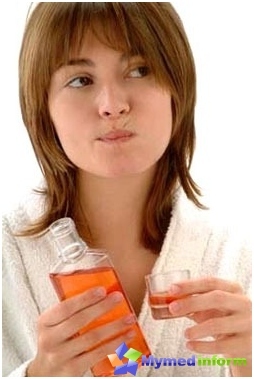 You can drink sour juices, so as not to irritate an already inflamed mucosa. A good tool to facilitate the patient's condition is a jelly of berries or fruits. Kisel is quite viscous, he is well envelops sore throat and reduces pain. Food should be soft, without spices and hot spices. In the treatment of angina can gargle decoctionherbs: calendula, chamomile, sage. Herbs relieve pain and help fight infection. To enhance the effect of rinsing, you gargle as often as possible: approximately every two hours. The oily solutions eucalyptus or fir can be used for inhalation. High temperatures will stay around 5-7days. Do not rush to shoot down the temperature until it rises to 38 or above, because in this way the body combats disease. The exception to this rule - children and people who have problems with cardiovascular system - it is better to shoot down the temperature, without waiting for it to rise to 39. To reduce the temperature, you can take Nurofen,or insert a rectal suppository, for example Tsefekon. If these medications are not enough, apply on forehead sick scarf, pre soaking it in cold water. In such cases, good help and sponging with cool (not cold!) Water or a warm bath. In no case do not Kuta patient with angina and poite hot tea - it is NOT propoteet and the temperature does not decrease, on the contrary, a person can lose consciousness from overheating. Warms the throat of the patient in the treatment of angina can be only when the temperature becomes normal. High temperatures greatly exhausts even the most resistant. Therefore be patient, if you happened to treat a patient with angina. Angina - communicable diseases, therefore,if possible, try to eliminate the patient's contact with others, especially with young children. Children are very difficult to carry angina, and complications they occur more frequently. If you can not isolate the patient from the children, he must always wear a mask to avoid infecting others. Ideally, angina need hospital treatment, under constant medical supervision. You have to understand that if a person is ill with angina,only folk remedies to cure it. In other related complications can occur. In the treatment of angina effective antibiotics, which must appoint a physician and do not take them to an independent discretion. When choosing an antibiotic the doctor is guided by the fact whether the sick are allergic to any kind of antibiotics, as well as what medicines he had been treated before. And of course, the doctor knows what antibiotic susceptible streptococci, which cause a sore throat. Therefore, it makes no sense now called antibiotics that you could treat a patient with angina. Call a doctor, so as not to harm the patient. Most likely, the doctor will prescribe antibiotics in the form of injections - because the drug is rapidly absorbed into the blood and begin to act. Then, after three to five days, doctors are allowed to take the antibiotic orally. In addition to internal use of antibiotics can betaking topical antibiotics, such as fyuzafyunzhin. This spray, which operates only on the mucous membrane to which it is sprayed. It effectively combats microbes cause inflammation, but its use should not be longer than 7 days - violated the microflora of the mouth, because it is also an antibiotic, although local action. When angina suffers immunity - in fact inflamedtonsils, one of the agencies that provide the body protection from infections and viruses. Therefore, after undergoing a sore throat it is important not only to try to strengthen the immune system, but also for 1-2 months, beware of hypothermia, take your vitamins, and try not to hurt anything. If after a month there again angina, it will have to be treated in a hospital, or a sore throat goes into a chronic disease that will poison a man's life for many years. So take care of your health, and be careful not to catch a cold.